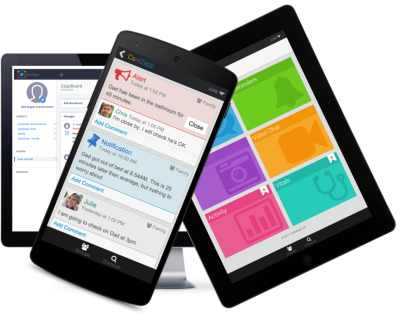 CareZapp connects providers, caring people and smart technologies. Empowering people to deliver better outcomes and more affordable care and support at home. Are you an innovative provider of care and support to people at home? If so, CareZapp was made for you! Our technology enabled care platform and companion app enhances the care and support provided by your valued staff. Enabling the people you support to live the most independent and valued life possible, whilst providing peace of mind to family and friends. Enhancing communication and collaboration among the care recipient, family, caregivers, support workers, volunteers and other caring professionals within a secure support network - we call it CONNECT. Leveraging best-of-breed technologies; ambient sensors and connected devices (the Internet of Things) for increased safety, wellbeing and better insights on a 24/7 managed basis - we call it INFORM. Enabling access to personalised and trusted community-based supports for social engagement, better purpose and wellbeing to simply live a valued life - we call it DISCOVER. The trusted support platform for care at home. Let's work together to deliver better outcomes and more affordable care. Together transforming care and support at home.